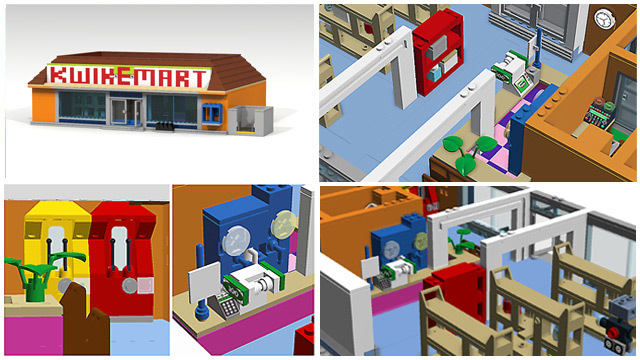 Want to see this The Simpsons Kwik-E-Mart Cuusoo made as a real LEGO set? Visit LEGO Cuusoo today for more information and help this project get the 10,000 supporters needed to reach the LEGO review phase. UK - 9 March 2014 - With the massive success of the LEGO Simpsons House comes the eagerly anticipated 550th episode of the much loved show due to air May 4th when we can expect to see many of our favourite characters given the plastic brick treatment! 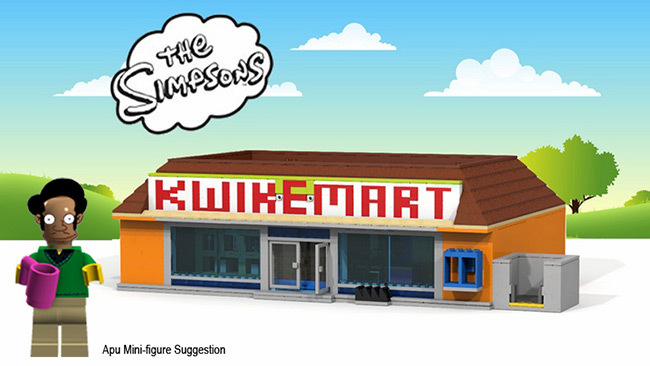 As well as some of the more iconic elements such as the Kwik-E-Mart sign, blue telephones and Squishee machine this Kwik-E-Mart Cuusoo comes complete with pull-down shutters, a CCTV camera and a safety-deposit-box for the security conscious Apu. The building opens up into two half's revealing a cross-section of the interior allowing for greater accessibility and playability, as well as an easily detachable roof comprised of two modular sections. Inside the set has lots of removable features including a double-door refrigerator unit, two arcade machines (as one removable item) plus shelving racks complete with products. 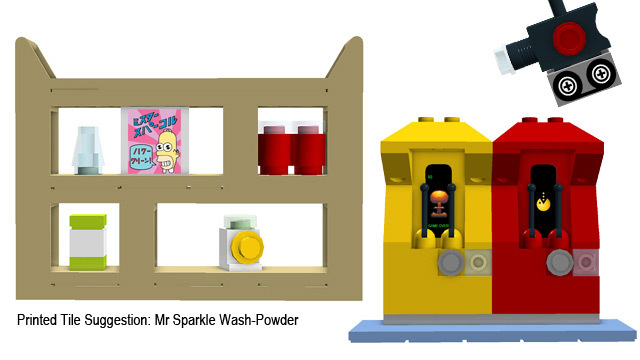 The model is as true to the cartoon as possible comprising of three main rooms: the shop floor, Apu's office and a small WC/broom-cupboard. 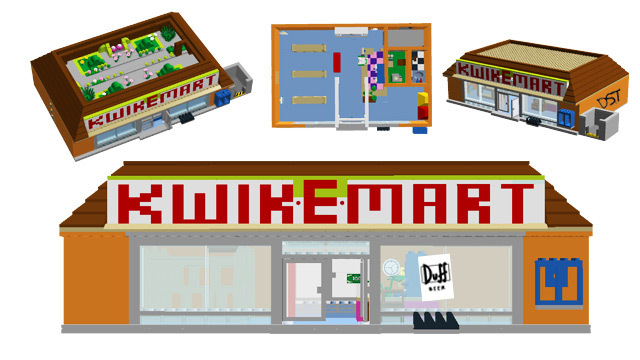 The Kwik-E-Mart's brightly coloured cartoon interior offers a vibrant pastiche of many real life commercial environments which is something this model aims to re-create. The set also comes with roof access to Apu's secret garden as seen in The Simpsons episode 'Lisa the vegetarian' (Season Four) as well as an Apu 'Thank you, come again' Nahasapeemapetilon Mini-figure suggestion. Create a Project, share your product concept, and see what other people think. Projects with 10,000 supporters are reviewed quarterly by LEGO for a chance to become an official LEGO product. If your project passes review and is chosen for production, you will receive 1% of the total net sales of the product. Visit LEGO Cuusoo to support this project today.